Instantly improve the audio performance of your PC, Mac or laptop with a dedicated sound card. These computer expansion cards are easy to use, and facilitate economical input and output of audio signals to and from your computer for the ultimate audio quality for music listening, gaming, and more. Today’s generation of sound cards set out to please even the pickiest of audiophiles. Available as PCI Express cards that plug straight into any available PCIe slot, they’re also available as plug ‘n’ play USB sound cards. Sound can be customised easily using swappable op-amps, while powerful built-in headphone amplifiers ensure crystal clear, focused sound for intense gaming, movie watching and music listening. Some sound cards require a dedicated power connector, others don’t. Sound cards from Asus feature incredible signal-to-noise ratios, utilising multi-layer PCBs to separate signal from noise for a clean signal. This means you can enjoy up to 7.1-channel sound of fantastic quality. High-end components allow the Asus Xonar DSX to deliver up to 128 different sound effects simultaneously, creating truly immersive 3D sound from your computer. Whether you’re looking to enhance your computer’s audio performance for work, for play, for gaming or more, a sound card can help you achieve the sound you want, instantly. 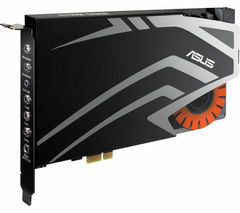 Check out our interface cards too to unleash even more power from your PC.